The global population health management market is driven by increase in usage of health care IT solutions and technologies. 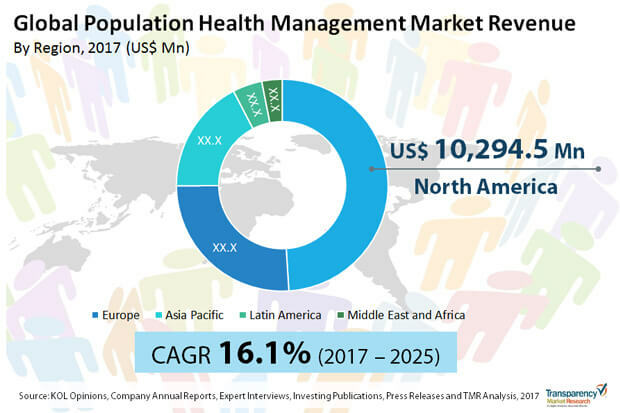 The global population health management market was valued at US$ 18,500.0 Mn in 2016 and is projected to expand at a CAGR of 16.1% from 2017 to 2025 to reach US$ 69,000.0 Mn by 2025. Growth of the market is attributed to adoption of health care IT solutions and increase of chronic diseases across the globe. Population health management (PHM) is a methodical and transparent delivery of services to improve the health status of a given population at a prospective price and to deliver better outcomes at lower cost. PHM programs are designed to keep defined patient populations, especially those with high-risk diseases, as healthy as possible while decreasing the need for costly interventions such as emergency department visits, hospitalizations, and invasive tests and procedures. PHM tools provide real time insights to administrators and clinicians, enabling them to identify the care management gap within risk patient population. The tools include improvement of medications, patient self-management, and cost management. The global population health management market is witnessing significant growth and is expected to expand at a high CAGR during the forecast period from 2017 to 2025. Adoption of health care IT solution for population health, increase in prevalence of chronic diseases such as diabetes and cardiovascular diseases, benefits of PHM tools such as remote health management, data integration, and data storage are expected to fuel the growth of the global population health management market during the forecast period. Furthermore, implementation of the Patient Protection and Affordable Act in the U.S. and rise in trend of big data are the factors likely to propel the global population health management market during the forecast period. Lack of awareness about population health management platforms in developing regions, high cost of installation, and unavailability of PHM platforms in many countries are the factors hampering the growth of the global population health management market. Furthermore, lack of knowledge about the tools restrains the market in many regions. The global population health management market has been segmented based on component, mode of operation, end-user, and region. Based on component, the market has been classified into software, services, and hardware. The services segment held major market share in terms of revenue in 2016. Services offered such as assistance in data analysis and post-sale client services are expected to drive the segment during the forecast period. Based on mode of operation, the global population health management market has been categorized into web-based, cloud-based, and on-premise. The web-based segment held the largest share of the market in terms of revenue in 2016, followed by the cloud-based segment. Increasing trend of cloud computing is one of the factors attributed to the fast growth of the cloud-based segment during the forecast period. Based on end-user, the global population health management market has been divided into health care providers, insurance providers, pharmaceutical companies, and others. The health care providers segment held the largest share of the global market owing to benefits of PHM tools such as reduction of care management gaps and reduction of per capita cost. North America is a major market for population health management, followed by Europe. Adoption rate of PHM platforms in the U.S., the U.K., and Germany is high as compared to the rest of the world due to high awareness among the people about the benefits of PHM, targeted efforts of government and non-governmental organizations toward chronic disease management, developed health care infrastructure, and high prevalence of the disease. The population health management market in Asia Pacific is growing at a rapid pace. Developed countries such as Australia and Japan are the major markets for population health management. Increase in disposable income, rise in awareness about PHM, and surge in government initiatives for disease management with the help of data analytics drive the market in Asia Pacific. The market in Latin America and Middle East & Africa is at a nascent stage and is expected to witness strong growth during the forecast period. Key players in the global population health management market include Koninklijke Philips N.V., Lumeris, Health Catalyst, McKesson Corporation, Cerner Corporation, ZeOmega, Healthagen LLC, UnitedHealth Group, International Business Machines Corporation, and Persivia. The research is a combination of primary and secondary research. Primary research formed the bulk of the research efforts along with information collected from telephonic interviews and interactions via e-mails. Secondary research involved study of company websites, annual reports, press releases, stock analysis presentations, and various international and national databases. The report provides market size in terms of US$ Mn for each segment and sub-segment for the period from 2017 to 2025, considering the macro and micro environmental factors. Growth rates for each segment within the global population health management market have been determined after a thorough analysis of past trends, demographics, future trends, technological developments, and regulatory requirements. A detailed qualitative analysis of factors responsible for driving and restraining the market and future opportunities has been provided in the market overview section. This section of the report also includes market attractiveness analysis that provides a thorough analysis of the overall competitive scenario in the global population health management market. Market revenue in terms of US$ Mn for the period between 2015 and 2025 along with the compound annual growth rate (CAGR %) from 2017 to 2025 are provided for all the segments, considering 2016 as the base year. Market size estimations involved in-depth study of product features of different types of population health management platforms. Additionally, market related factors such as rise in preference for cloud-based computing, prevalence of chronic diseases, projected launch of new products in various geographies and historical year-on-year growth have been taken into consideration while estimating the market size. Population health management (PHM) is a methodical and transparent delivery of services to improve the health status of a given population at a prospective price and to deliver better outcomes at lower cost. PHM programs are designed to keep defined patient populations, especially those with high-risk diseases, as healthy as possible while decreasing the need for costly interventions such as emergency department visits, hospitalizations, and invasive tests and procedures. Based on component, the global population health management has been segmented into software, services, and hardware. The services segment is anticipated to hold a significant share of the global market during the forecast period. In terms of mode of operation, the global population health management has been classified into web-based, cloud-based, and on-premise. The web-based segment is anticipated to dominate the market during the forecast period due to advantages such as efficient communication with stakeholders and tracking the progress of patient over multiple centers. Geographically, the global population health management market has been segmented into five major regions: North America, Europe, Asia Pacific, Latin America, and Middle East & Africa. In addition, the regions have been divided into major countries from each region. The report also profiles major players in the global population health management market based on various attributes such as company overview, financial overview, SWOT analysis, key business strategies, product portfolio, and recent developments. Key companies profiled in the report include Koninklijke Philips N.V., Lumeris, Health Catalyst, McKesson Corporation, Cerner Corporation, ZeOmega, Healthagen LLC, UnitedHealth Group, International Business Machines Corporation, and Persivia.